Photos: Keynote speaker, David Owen (top left), IDA 2017 Board of Directors (top center), award recipient, Charlie Goldberg with parents (top right), SKYGLOW authors Harun Mehmedinovic and Gavin Heffernan (middle left), Stephen Goldsmith (middle center), AGM attendees visit Salem, MA (middle right), AGM attendees mingle with SKYGLOW authors (bottom left), opening panel (bottom center), IDA volunteer Paras Pirzada (bottom right). The 2017 Annual General Meeting in Boston brought IDA supporters, members, and chapter leaders together with more than 40 speakers from around the world. 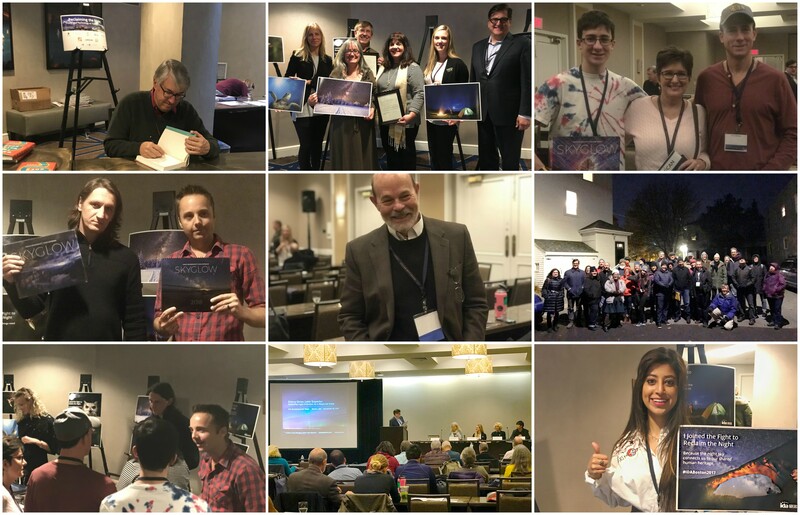 Experts, advocates, artists, and night sky enthusiasts of all stripes shared their success stories, cutting-edge research, case studies, questions, concerns, and passions for protecting the night. The three-day conference covered a wide range of topics, including technology advances, award-winning lighting design, effects of artificial light on wildlife, human health concerns, policy approaches, night sky festivals, diversifying our mission for greater success–and so much more. Friday’s opening panel, entitled, Inspiring Change in Your Community: Success Case Studies Part I pulled together chapter leaders from Duluth (Cynthia Lapp), Rapid City (Diane Knutson), and New York City (Susan Harder), with a Chinese college student (Ruoyu Li) representing IDA Beijing. Talk about a geographically widespread sampling of dark sky defenders! On Friday evening, timelapse astrophotographers and authors Harun Mehmedinovic and Gavin Heffernan shared with us insights they have gathered in the making of their fascinating film and book: SKYGLOW. Their presentation spanned the historical context of the night, from its relevance to indigenous populations to the very first electric streetlights, through today, where the view of the stars is so often obliterated by glaring lights. On Saturday evening, despite freezing temperatures, a group of 30 attendees piled into vans for a trip to Salem to see the historic town’s recent retrofit of streetlights to 3,000 Kelvin LED. This was a significant opportunity for folks on the ground to not only witness best practices first hand–but also an important venue for networking and building stronger ties within our community of grassroots advocates. Our final panels on Sunday morning were particularly inspiring with their respective focus on “Intentionally Diversifying Our Community for Greater Success” and, “At 30 Years, What Does the Future Hold for IDA?” We could also ask: What does IDA Hold for the Future?–because the feeling coming out of these sessions was that we are poised to leap forward with our mission. The fight to control light pollution and to connect people globally with the wonder of the night skies is coming of age. Our community is already diverse in many ways, but we are mindful of the urgency to welcome everyone–across cultures, races, political persuasions, education and socio-economic divides. We are also considering future trends and needs that can be predicted right now: automated vehicles and their impact on lighting needs, future installations of model lighting ordinances, demonstration tools that help people better understand what can be achieved with the right lighting choices, as well as the next generation of LEDs. We hope you will join us at next year’s Annual General Meeting which will be held in Snowbird, Utah, November 9 – 11, 2018.